Emblem of Kata'ib al-Jabalawi. The top reads: "Syrian Arab Republic." 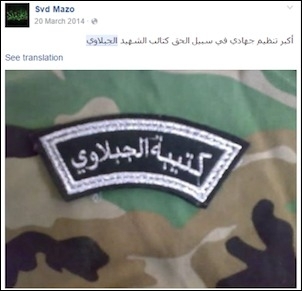 The bottom: "Katibat al-Jabalawi" (al-Jabalawi Battalion, interchangeable with Kata'ib al-Jabalawi). The person in the centre of the emblem is one Mazen Jabalawi, about whom more below. The Homs area is home to a number of pro-Assad militias, including Liwa Khaybar and the Leopards of Homs. Kata'ib al-Jabalawi is another militia from Homs. The group's name derives from a prominent pro-Assad commander and 'martyr' called Mazen Ali Ahmad (al)-Jabalawi. He was originally from the Alawite village of Jabalaya located to the northwest of Homs city, and was said to have been killed in Deraa on 11 November 2013. The mujahid commander, amir of martyrs, the martyr hero Ali Khazzam with the leader hero, leader of the group of glory, honour and sincerity that rushed since the beginning of the events in Homs to defend the people of Homs, the martyr hero Mazen Jabalawi, the brother-in-law of the martyr Ya'arab al-Darbuli who was martyred in Deraa a week ago. The martyr commander Mazen Jabalawi has been newly-wed since only two months ago. The martyr leader Mazen Jabalawi waged many battles with his martyr companions in most of the towns of Syria: Homs, Homs countryside, Aleppo, Aleppo countryside, Deir az-Zor and finally Deraa, where he wished only to be a newly-wed in her while breaking the siege from companions-in-arms. The martyr Mazen Jabalawi: Bab Hawd, Jurat al-Shiyah and al-Khalidiya [areas in Homs city] know him very well. Every stone in them knows this hero and the members of his group. Ask the pigs of old Homs how many woes this lion made them taste. Ask Qusayr how many pigs were trampled on at his hands. Ask the noble people in Homs about the field commander Mazen al-Jabalawi who took martyrs as brothers to him, heeded the call and has joined them as a noble newly-wed leader not knowing defeat. The formation in his name – Kata'ib al-Jabalawi – notably turns up in March 2014 in a pro-opposition report on pro-regime militia dynamics in Homs, relying on an alleged leaked document, which "on one of its pages points to the appearance of a new type of militias and considers them to be more dangerous than the [National] Defence militias themselves, and it dubs the militia as being called 'Kata'ib al-Jabalawi' that became independent of the National Defence, and harbours hostility to the Syrian army and all the battalions and militias loyal to it, including Hezbollah." In one instance, the document supposedly says that Kata'ib al-Jabalawi carried out an ambush against rebels in the Sakra region in eastern Homs countryside, bringing the bodies to the heart of Homs and inviting media to cover the event. However, the militia barred the Iranian channel al-Aalem from covering the event on account of its coverage of news related to Hezbollah, while threatening any outlet that credited other forces besides Kata'ib al-Jabalawi as participants in the operation. On social media, some brief references can be found to Kata'ib al-Jabalawi in 2014 (below left). From a pro-regime account from Homs: "The greatest jihadi organization in the path of Truth: Kata'ib al-Shaheed al-Jabalawi" (cf. this post from November 2014). In the current form that can be found on social media, active promotion of Kata'ib al-Jabalawi can be traced to around the spring and early summer of 2015. 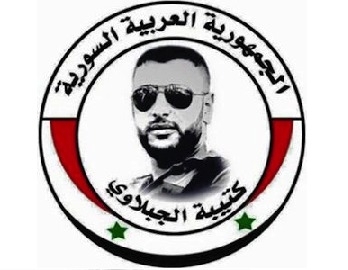 This is rather similar to the Leopards of Homs, which dates back in its first iteration to 2012 – with its leader Shadi Jum'a becoming involved in National Defence Force circles in Homs and then apparently identified as leader of a contingent of his own by 2014 – but in the current iteration on social media can be traced to roughly the same time frame of spring and early summer of 2015, as it became affiliated with the al-Bustan Association of prominent regime businessman Rami Makhlouf. Likewise, Kata'ib al-Jabalawi as it is currently promoted, under the military leadership of one Abu Ahmad Khalid Wusuf and the general leadership of an Abu Ibrahim, shows an affiliation with the al-Bustan Association. Indeed, one page set up for Kata'ib al-Jabalawi is dedicated to various 'martyrs' for the group and explicitly mentions the affiliation. The militia is also defined as part of the "Popular Defence Forces in Homs" – a term used to refer to the Leopards of Homs as well. Sample activities that point to the al-Bustan Association affiliation include the provision of protection for an iftar celebration set up last month by the al-Bustan Association to commemorate the anniversary of Hafez al-Assad's death. In keeping with the idea of continuity with Mazen Jabalawi, claims and commemorations for 'martyrs' can be found going all the way back to at least 2012. Examples follow below. More recent engagements of note include fighting in East Ghouta, where Kata'ib al-Jabalawi has claimed at least one notable 'martyr' in Ammar Jamal Mahmoud, who was killed on 29 November 2015 and had previously been renowned for his role in the fighting in Deraa, where Kata'ib al-Jabalawi had also been fighting in early 2016. In addition, Kata'ib al-Jabalawi participated in operations in the Qaryatayn area to the east of Homs against the Islamic State that ultimately led to the recapture of the town by early April 2016: during this operation, the militia most notably claimed a 'martyr' in an individual named Ali Abbas Muhammad, who was said to have been killed on 21 March 2016. Katai'b al-Jabalawi had also taken part in operations in eastern Homs countryside in the previous summer as the Islamic State had been making rapid advances across the Homs desert at the expense of the regime: for instance, the group claimed a 'martyr' in an individual called Kenan Dayub, killed fighting in the Sha'er field area, and some fallen fighters in the Jazal area. Finally, the group participated in the siege of Zabadani through the summer of 2015 (claiming that one of its fighters by the name of Muhammad al-Qasim was killed on 26 August 2015) in addition to fighting in the al-Ghab plains in the northwest of Hama province as the Russian intervention commenced. The history of Kata'ib al-Jabalawi points to a complex evolution over time, evolving from pro-Assad militia networks in Homs that cannot simply be reduced to monochromatic labels like shabiha, which as Aron Lund notes has often been adopted uncritically as a generic term when its applicability is much more specific. The militia with the seemingly closest parallel history is the Leopards of Homs. Both the Leopards of Homs and Kata'ib al-Jabalawi seem to have grown within the Homs National Defence Force networks, then became their own outfits in some way before apparently reforming under affiliation with the al-Bustan Association in 2015. The al-Bustan Association affiliation can perhaps be seen as part of a wider project of bringing Homs militias seen as loose cannons under the cover of the Syrian state, particularly if we give credence to the early 2014 report suggesting tensions between Kata'ib al-Jabalawi and other pro-Assad actors in Homs at the time. Update (21 July 2016): An earlier reference to Kata'ib al-Jabalawi and an al-Bustan Association affiliation can be found at least as early as May 2014. Therefore the chronology of the group's evolution seems to diverge somewhat from that of the Leopards of Homs. Also of note was participation in an operation in the Damascus area in late 2014.